There was a sound from the music ministry that hadn’t been heard or seen before. There was jubilation. There was movement. There were keyboards and hammonds and drums and horns and then, praise and worship – which is now a staple in most of our churches. That act alone was amplified at Full Gospel. Twelve “founding fathers” – many of them who were supporters of the traditional baptist conventions – stepped out and stepped away to partner with Bishop Paul Sylvester Morton, pastor of the St. Stephen Baptist Church, New Orleans. Joining Bishop Morton was Bishop Odis A. Floyd (who had folded his Free Spirit movement in with Full Gospel) of Flint, MI; Bishop Larry D. Trotter of Chicago; Bishop Carlos L. Malone of Miami; Bishop J.D. Wiley of New Orleans; Bishop K.D. Johnson; Bishop Larry D. Leonard of Houston; Bishop Kenneth Robinson of Little Rock; Bishop Kenneth Ulmer of Los Angeles; Bishop Fred Caldwell of Shreveport; Bishop Robert Blake of New Orleans; Bishop Eddie Long of Atlanta; and Bishop A.R. Williams. (Sorry I don’t have all of the hometowns for the Bishops). These men constructed a new structure – from scratch. Gone were District Associations, District Congresses, State Conventions and State Congresses, gone were even national “conventions.” They even had the “nerve” to change the administration of a national group of predominantly black baptists from a democracy to a theocracy. The answer from Bishop Morton and the Founding Fathers was simple – “Baptists have a right to choose.” While denominational leaders cursed them, the Fellowship grew. Younger pastors, who had no allegiance to the historic conventions or who saw no value in the conventions, left in droves. This was also around the time of the demise of Bishop College – where young seminarians were introduced to and received support from the National Baptist Conventions. Even pastors who questioned the necessity of supporting conventions where denominational leaders were not responsive or appeared concerned about them personally but were too engaged to operate corporately – that pastors and their congregants. Nobody wants to be a member of a convention and the leadership act as though they don’t care about empowering or encouraging the local pastors. 20 years later, Full Gospel is still around. Vibrant. Alive. They met this week in Louisville in their annual 6 in 1 Conference – a Pastors Conference, a Men’s Conference, a Women’s Conference, a Youth Conference, a Young Adult Conference and a Worship (Music) Conference. When I parked my car at the Galt House – something impressed me. I saw license plates from literally all over the country. 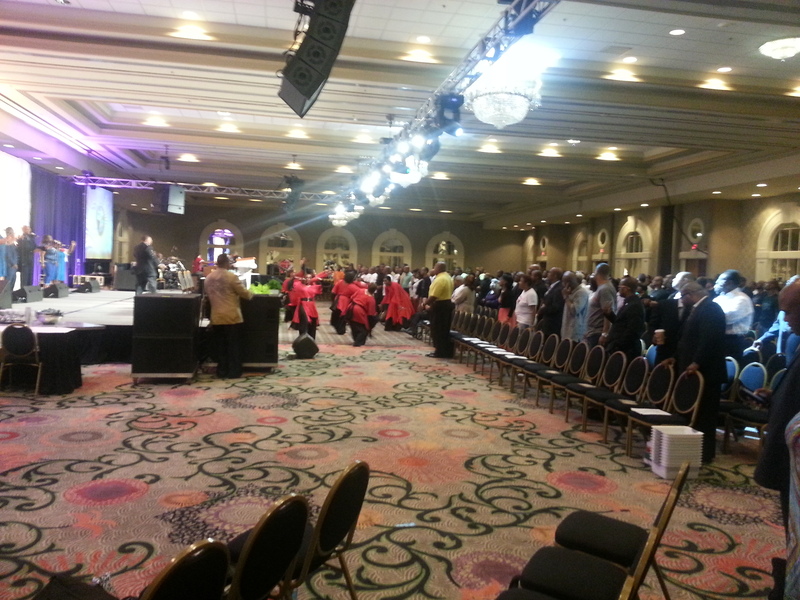 Bishop Neil C. Ellis announced that he led a delegation of 500 persons from The Bahamas, who paid over $750 each to attend the Conference. Inside the hallway I saw something else – pastors from the National Baptist Convention, USA, Inc., the National Missionary Baptist Convention of America, the Progressive National Baptist Convention, Inc., and the National Baptist Convention of America, along with pastors from other baptist and non-baptist traditions. Even with Bishop Morton preparing to retire as International Presiding Bishop in 2015 . . . the Fellowship will, no matter who’s in charge, will survive. I saw young pastors, adult pastors, and elder pastors. I saw singers and recording artists. I saw an exhibit hall that offered resources that outweighed hats, shoes and suits. I saw resources from colleges to insurance to information. I saw giving on a level without brow-beating and coercing. I saw corporate sponsorships coming from the likes of McDonald’s. I saw a technical savvy like I’ve never seen before. I saw youth and children stopping and praying for each other. Full Gospel is open to all. There is no such thing as women being in subservant or secondary roles. There are pastors who don’t have women in ministry, but they aren’t protesting the vision of Bishop Morton, by allowing women to serve, preach and teach. What you don’t hear are the chaotic reports, the excuses for dwindling attendance, the motions and seconds, and you don’t hear any pastor bashing – it is never tolerated. The people are taught to honor the men and women of God at the pastoral level. I have been strengthened this week, I’ve been encouraged this week, and I’ve been helped this week. I don’t know about the four traditional conventions – but I think the paradigm has been challenged by Full Gospel and maybe the order needed a good holy kick. I predict that we may see, in this generation, either consolidation of some of the tradition conventions or in order for them to survive – a drastic change is in order. Well said. Our other conventions need to take note. You write great articles. Very insightful. God Bless you on your recovery. From a young inspiring pastor. Talking about a right…how about the imperative to rightly divide the Word of Truth? Does a little leaven level the whole lump? Does history show that compromise in the non essentials leads to compromise in the essentials of the faith? Any person who studies the languages will come away with the undeniable truth that the FGBCF’s doctrine is unsound. Huge gatherings, many age groups, many national recording artists doesn’t mean anything and I’m not saying that YOU are saying it is…but I trust that you do know that a huge gathering does not warrant the Lord’s presence nor His sanction. I see the issue being the failure to earnestly contend for the faith. When we choose the politically correct mentality when it comes to the Word of God then anything will creep into the church. Anyone who reads the FGBCF Distinctives will see that there are few differences from the Baptist doctrine. The exceptions are freedom in worship and we do believe in women in ministry which are all sound…in the last days I will pour out my spirit upon all flesh and your sons and daughters shall prophesy. Thanks for this post, Houston. I saw the final two nights of the meeting on The Word Network. And it left me with mixed emotions. I am not a Charismatic. But I know and respect some who are a part of Full Gospel. There is definitely a sense of order, excellence, and passion that makes the Full Gospel meetings attractive. At the same time, that is my concern. It is too experience-driven, rather than truth-driven. The contrasting themes of the broadcasted messages Thursday and Friday demonstrate this sufficiently. I do not have a dog in this fight. But after I watched two nights of this meeting, I was burdened again to pray the Lord would raise up examples that you don’t have to be Charismatic or Word of Faith to be a Baptist with a ministry that exhibits integrity, excellence, and fruitfulness. Great comments. I wanted to focus in primarily on their structure. I have seen our traditional baptist conventions split and duplicate the exact same structure. I believe that one of the reasons for their success has been bringing to the table a completely new and different structure. When NBCA and NBCUSA split, they took the same structures with them. When PNBC and NBCUSA split, they took similar structures (with some exceptions) with them. When NBCA and NMBCA split, they took similar structures with them. However, this time when FGBCF organized they had such a new structure, new objectives, heavy media, and presented a 365 days a year convention – it drew a lot of talented and gifted pastors and supporters. It easily is one of, if not the, largest baptist gatherings in the country. It should be noted that the contrasting themes of Thursday and Friday may stem from the fact that two different groups were being represented. On Thursday night, Bishop Morton spoke representing FGBCF and on Friday night Pastor Jamal Bryant who was a guest preacher from the AME church and outside of the fellowship spoke. The two come from different generations and denominations which can account for some contrast. Finally, I would suggest that charisma is a characteristic of both Jesus and the Holy Spirit. This is not to say that the entirety of ministry is driven by charisma yet at the same time we cannot negate its presence and still be Christlike. Substance with charisma is necessary. Great article! Your love and passion for the church comes across in your writing. I pray you’re recovering well. It is easy to condemn something when you are on the outside looking in. The truth of the matter is that, the foundational beliefs of Full Gospel are no different than those of traditional baptist. The two areas where there is disagreement is the role of women in ministry and speaking in tongues. I was once in the same place as others are now concerning Full Gospel, but in my praying and seeking God about the matter He asked me one question, “Am I not Sovereign, can I not do what I want to do with whom I chose to do it with?” I could only say yes Lord. None of us are that spiritually in tune with the mind of God to be able to say what he will or will not do. Even Jesus did not know everything that the Father was thinking. Also, lest we forget when Jesus can on the scene, what he taught and did challenged that religious order of that day. My advise is to do as the word says, “try the spirit by the spirit”. I wish i had archived more of the West Coast history. I am Pastor Roscoe Bradley in fellowship with Bishop Ulmer we organized the California area. We called our selves Bapticostal there were twenty plus churches and Pastors that were in a new season of revival of worship and ministry , but at the same time mired in traditional structures that did not affirm them. We are grateful that this came about. But there is still a need to improve out reach and support of the “little pastor and church”. Its hard in a recession to run and minister in a small church especially the bi-vocational pastor. I watched the FGBC Convention online. And I must say, out of all the conventions/convocations that I’ve seen, and I’ve seen many, between COGIC, COOLJC, PAW, NBCUSA, and PCJC, the FGBC was the most awesome I’ve seen. As far as doctrine is concerned, I’ve always questioned the “traditional” Baptist Church’s views on doctrine and people. For instance, the church where I am a minister, will “tolerate” women who were already ordained into ministry, but will not, under any circumstances, ordain women into the Diaconate or vocational ministry. Was not Deborah a judge? Was not Phoebe a deacon (and not simply a deaconess, as popular belief will have it, since the word had not even been created until some 300 years after the writings of Paul) Was not Mary Magdalene the first evangelist? Did not the word say He’ll pour out His spirit upon all flesh? These things needs to be addressed. Also, the ideology of a congregational church, in my opinion, is not biblical. The prophets of the OT were chosen directly by God, and the apostles by Jesus Christ and the Holy Spirit. I’m far from a Bible scholar, but I have never seen anywhere where the people chose their leader. God heard what they wanted, and He acquiesced and He gave them what they thought they wanted, and when they did, it worked temporarily, then failed (I compare this to my church, which has had 5 pastors in 25 years, because they thought they wanted something that was not in the will of God.) I agree with many of the Baptist doctrines, but I feel that FGBC ideas of Bishops is justifiable by the Word. None of us are perfect, but I honestly feel that Bishop Morton’s leadership to form FGBC has done a great work. I pray that God continues to work with them. Shucks, after watching the convention, I may join FGBC. How does everyone feel now that that Full Gospel is going through turmoil, just after the 20th anniversary? I am saddened about some of the stuff that has happened, especially thinking about the fact that for 20 years, FGBC was one of the few organizations that really didn’t have a lot of controversy. But whenever there is change, things do happen. I just pray that God, in His infinite wisdom, will sort it all out and God can be glorified and the people edified.